August is the best season of Edinburgh, when trees and flowers are in full bloom. Every year at this time, a large number of tourists from around the world come to join and celebrate the annual Edinburgh International Festival. The city is crowded with people dressed up in special apparel, and large firework shows are displayed. Wonderful performances including drum parades, street performances and singing by artists from around the world are greeted with enthusiasm and delight. The theater was fully booked by an audience of more than 3,000 people. 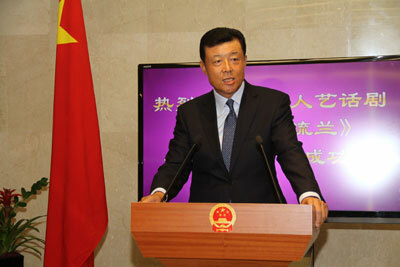 Chinese Ambassador to the UK H.E. Liu Xiaoming and Madam Hu Pinghua, Director of Beijing People's Art Theatre Zhang Heping, Consul General to Edinburgh Li Ruiyou, Deputy Speaker of Scottish Parliament John Scott, Lord Provost of the City of Edinburgh Donald Wilson, Edinburgh International Festival Director Jonathan Mills and Minister Counselor of the Cultural Section, Xiang Xiaowei also watched the performance. Coriolanus is an important piece of Shakespeare’s later works with beautiful language, fast-moving plot, profound ideas and high artistry. Translated by Ying Ruocheng, the play was rehearsed by Beijing People's Art Theatre independently, with Lin Zhaohua as the director and Pu Cunxin performing the leading role. 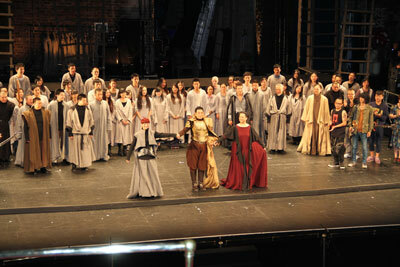 The performance was in Mandarin with English supertitles. In particular, the play breaks free from the traditional form and boldly introduces heavy rock music to emphasize war and tragedy, which is a highlight of the play. After the performance, the audience responded to the wonderful performance and the excellent team with a long round of applause. The curtain call of the premiere lasted for eight minutes. Deputy Speaker John Scott spoke highly of the stunning performance. Lord Provost Wilson expressed his appreciation for the performance and gave a banquet to the members of the art troupe in the city hall, making the Beijing People's Art Theatre one of few foreign troupes that have been invited to a banquet by the Lord Provost in this year’s Edinburgh International Festival. 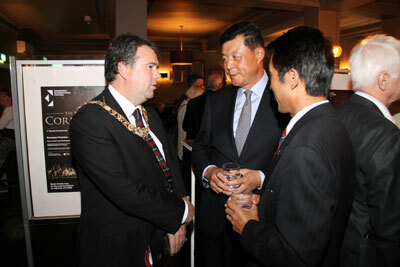 On the 21st, Consulate-General of China in Edinburgh held a reception for guests in celebration of the success of the premiere. 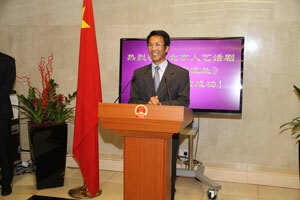 Ambassador Liu attended the reception and delivered a speech. Ambassador Liu spoke highly of the performance and expressed his thanks to the outstanding artists from Beijing People's Art Theatre for blessing people with such a visual and auditory feast, as well as promoting China-UK arts and cultural exchanges and increasing mutual understanding between Chinese and British people. 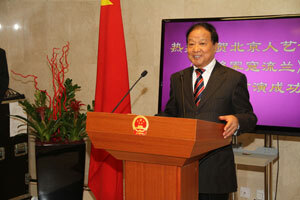 Ambassador Liu briefly reviewed the successful performance of British masterpieces, like The Revenge of the Prince, Richard III and Jane Eyre performed by Chinese artists in recent years. He pointed out that Beijing People's Art Theatre has brought a Chinese production of Coriolanus to the home country of Shakespeare, and this Chinese adaptation is a tribute to Shakespeare, the performance of which is a dream fulfilled and a home-coming event. This unconventional marriage of the drama and rock music has given this performance extra vitality. This bold and implausible exploration by Chinese artists has added to the appeal of the Edinburgh International Festival. Ambassador Liu hoped that in the years ahead, Chinese and British cultural circles will build on this performance, and work together to undertake more high quality cultural projects, strengthen the cultural links between both countries and forge stronger bond between the two peoples. 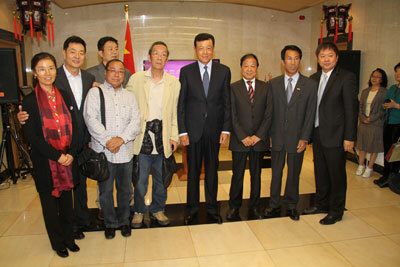 Director of Beijing People's Art Theatre Zhang Heping, who also led the delegation to the Festival, expressed his thanks to the audience for their positive evaluation of the play. He said that Coriolanus is a famous classic play of Shakespeare and during the rehearsals of the Beijing People's Art Theatre, they made some bold innovations in the content and form, adding many Chinese elements, giving it a new distinctive attraction. It is exciting to see the play taking stage on such a big platform as the Edinburgh International Festival in its premiere, sharing the arts of the Beijing People's Art Theatre. Beijing People's Art Theatre will continue to work hard on the basis of this successful performance and bring more excellent works to the world. Mainstream media from China and the UK including, Xinhua News Agency, CCTV, China News Service, BBC, the Daily Telegraph, the Guardian, Financial Times and the Scotsman and entertainment magazine Stage all reported the performance and gave positive remarks on it. The Financial Times rated the drama with four stars. BBC Evening and BBC Morning also positively assessed the premiere of the performance and made reports about it several times, calling it “magnificent”, “spectacular” and a good interpretation of the original work. They also focused on the introduction of the heavy metal music and stressed the innovative form that refreshed the audience and boosted the whole performance. Chinese Embassy to the UK and Consulate-General of China in Edinburgh paid much attention to the participation of domestic art groups in the Edinburgh International Festival. Ambassador Liu came from London to attend the premiere. The Cultural Section of the Chinese Embassy to the UK, Consulate-General of China in Edinburgh, Ministry of Culture, Beijing People's Art Theatre, the Committee of the Festival and City of Edinburgh Council stayed in close communication and provided support for the visiting art troupe to ensure the success of their performance. The Edinburgh International Festival is the largest international art festival in the world with a high reputation and great artistry. Since its establishment in 1947, the Edinburgh International Festival has been held in Edinburgh, Scotland every August and September, with performances of classical music, plays, operas, dances and visual arts and supporting activities in more than ten relevant fields. This year, the festival was held from August 9 to September 1. Providing 161 activities and programs. Beijing People's Art Theatre was invited to perform the Chinese version of the Tragedy of Coriolanus, adapted from Shakespeare’s Coriolanus, and became the highlight of this year’s festival. Over a year ago, New Beijing Opera the Revenge of the Prince by Shanghai Jingju Company and the original ballet Peony Pavilion by the National Ballet of China performed at the Edinburgh International Festival and were also well received.